Passionately directed and beautifully narrated, this poetic black and white film about the world’s first female rabbi is wholly inspiring but in terms of cinematography, it lacks a certain spark. 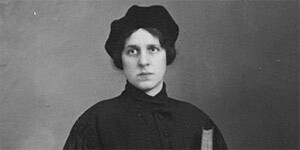 Written and directed by Diana Groó, Regina tells the story of Regina Jonas (1902-1944), the world’s first female rabbi. Having grown up in Berlin’s Scheunenviertel as the daughter of an Orthodox Jewish peddler, Jonas was ordained in Berlin in 1935 and her incredible religious devotion brought hope and encouragement to many persecuted German Jews. Despite many rabbis emigrating due to Nazi persecution, Jonas admirably continued to work tirelessly in concentration camps and was tragically murdered in Auschwitz in 1944, aged 42 years old. Voiced by Rachel Weisz and executive produced by her father, George Weisz, Regina pays tribute to the inspiring woman, using the only surviving photo of Jonas as a leitmotif for the film. Beautifully written and passionately directed by Groó, Regina is a profound and poetic documentary that pays a graceful tribute to Regina Jonas, who serves as an undeniably inspiring subject for the film. With her soft-spoken voice, Rachel Weisz is well cast as Regina, and together with the gentle music by Dániel Böhm and Dániel Kardos, the documentary enjoys a suitably compassionate sound. Merging various footage of early twentieth century Jewish life in Berlin, Ágnes Mógor’s skilful editing ensures a poignant backdrop for Groó to tell Regina Jonas’ incredible story, which as you can imagine, is rather moving. Unfortunately, Regina will probably struggle to entice mainstream audience members, due to its rather dull cinematography. Although the monochrome footage is effective in many ways, it doesn’t provide much visual magnetism and the slow-moving photography can prove quite testing to stick with. Thankfully though at just over 60 minutes long, Regina doesn’t overstay its welcome and so maintaining focus and attention isn’t quite as challenging as it potentially could have been. Despite its lack of visual attractiveness, this poetic slow-burner is still worth seeking out, thanks to the beautiful narration by Weisz and the incredibly inspirational story of Regina Jonas in general.